Using THORS, it is possible to optically reflect and guide sound waves in air. We are currently applying this technique for enhancing the distance of standoff photoacoustic measurements of trace species in air. 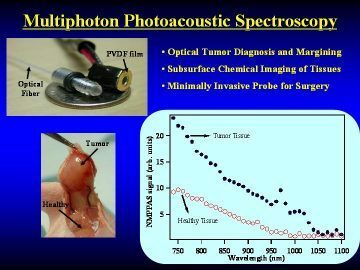 Using multi-photon excitation of endogenous chemical species in tissue via near infrared light, followed by photoacoustic detection, sub-surface imaging and margining of brain tumors is possible. 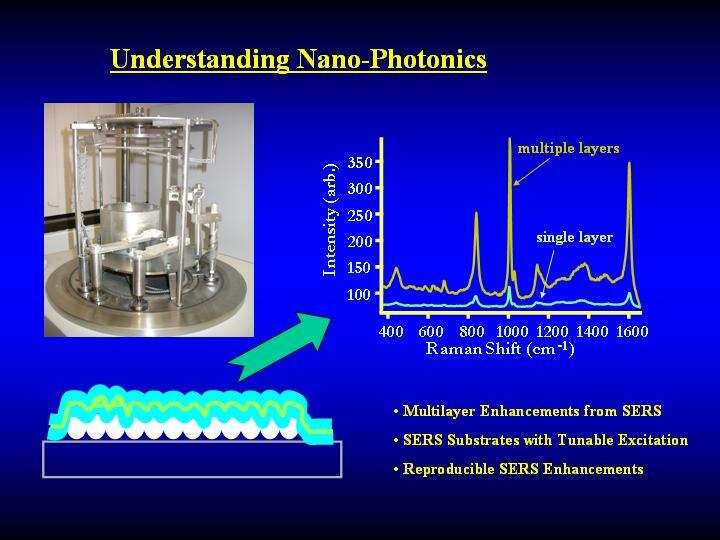 Using a tapered surface enhanced Raman scattering (SERS)-based fiber optic imaging bundle it is possible to obtain dynamic, chemical images of microscopic objects (~ 20 microns) with sub-50 nm spatial resolution. We are applying this technique to image in real-time the dynamics of cellular surface and lipid raft events in a label-free manner. 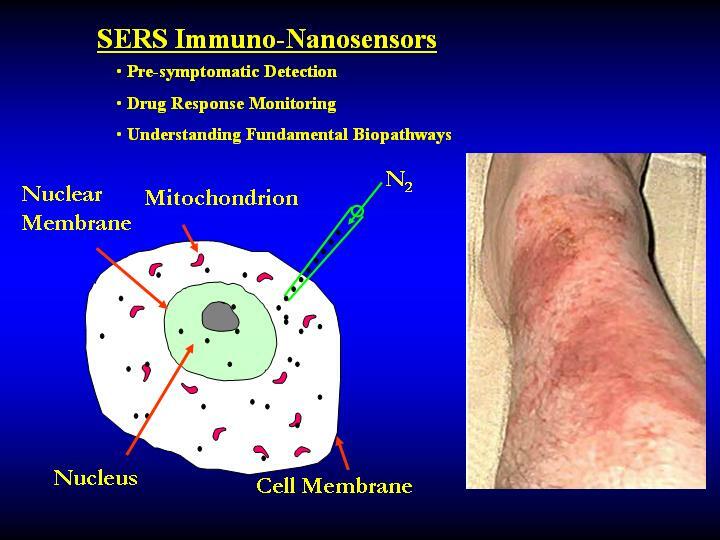 Using surface enhanced Raman scattering (SERS)-based optical nanosensors coupled with optical tweezers-based positioning and multi-spectral imaging, we are able to monitor real-time protein expression and biochemical pathway activation as well as provide a means of pre-symptomatically monitoring disease state progression. 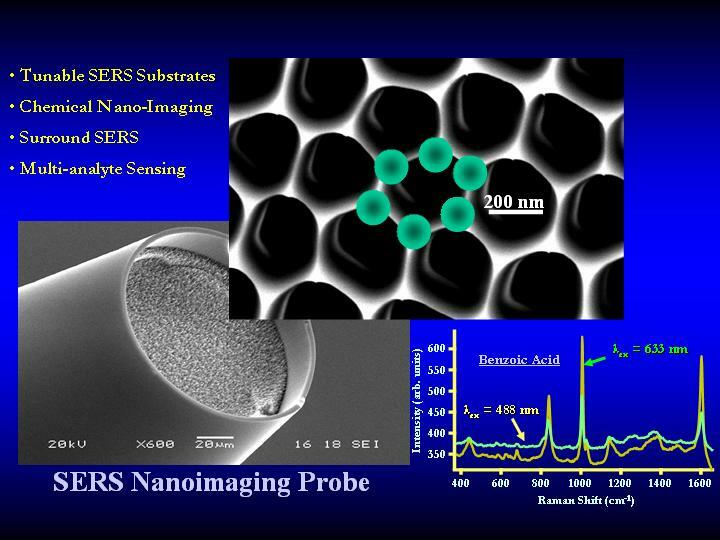 Using alternating layer of metal and dielectric materials, it is possible to significantly enhanced SERS signals on caribou SERS nanostructure, providing over an order of magnitude improvement in sensitivity for many applications. Welcome to The Cullum Group website. 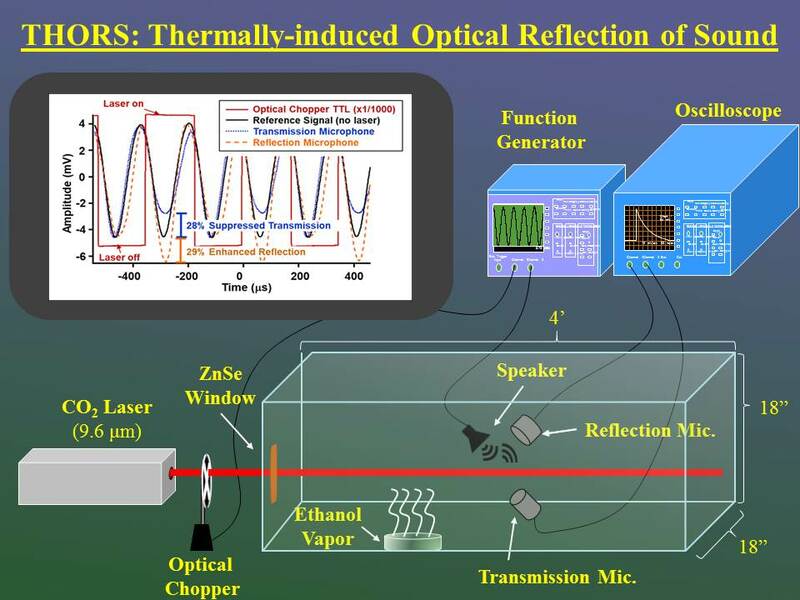 Our group exploits novel optical phenomenon to develop novel optical sensors/nanosensors and sensing methods for biological and defense related analyses, ranging from intracellular nano sensors and nano imaging to non-invasive imaging of brain tumors and optical reflection of sound waves. Please look around at the different ongoing research projects and current and past group members to get a feel for the exciting research efforts going on in the lab. The group is quite interdisciplinary spanning aspects of chemistry, biology, physics and engineering and is made up of students from various majors. Explore the exciting research opportunities in our group as well as others in the Department of Chemistry and Biochemistry and the Center for Translational Nanobioscience at UMBC. We have fun with light while making difference in the world.